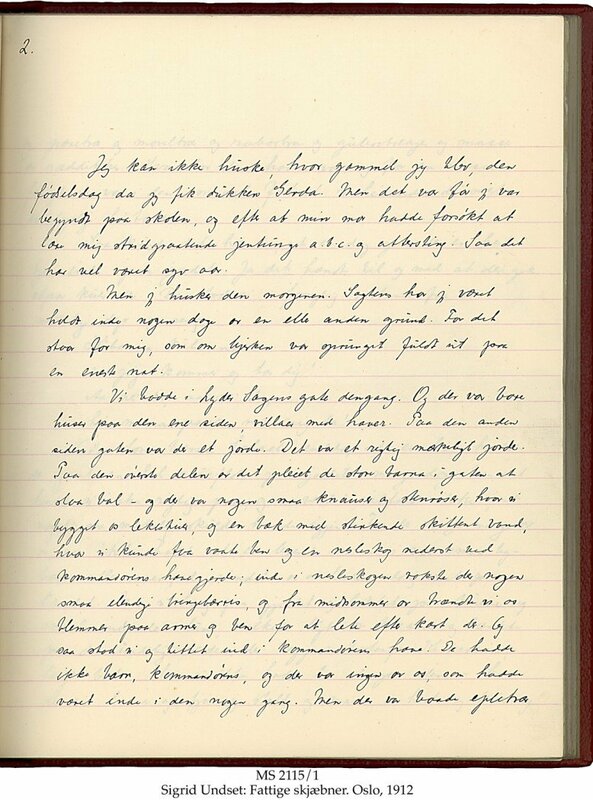 Description	 MS in Norwegian on paper, Oslo, Norway, 1912, 119 ff., 26x20 cm, single column (20x16 cm), 23 lines in cursive script, autograph, signed. Binding	 Oslo, Norway, ca. 1950-1970, red leather, gilt spine, sewn on 4 cords. Provenance	 1. 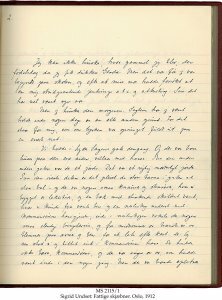 Sigrid Undset (1912); 2. Publisher, Oslo (1912); 3. Bjørn Hansson, Oslo (-1995); 4. Arild and Morten Hansson, Norway (1995-1996); 5. Damms Antikvariat cat. 650, Auksjon 18.4.1996:145. Sigrid Undset (1882-1949) Norwegian author. She received the Nobel prize in 1928. A.C. Svarstad was her husband. This is the printer's copy.